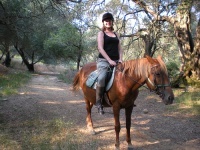 Corfu offers popular excursions for riders of all levels. The trails cover woodlands, the village of Ano Korakiana, olive groves, vineyards, and pastures. Riders may also visit some of Corfu's attractions or stop to picnic. Afterwards, children can usually feed carrots and apples to the horses. Kos Island offers great riding as well. Alfa-Horse Riding Centre does tours down the slopes of Mount Dikeos, or to the chapel of St Theologos in the mountains. It's always a good idea to book riding trips in advance.